Mike Cook’s Bonneville Shootout at the Bonneville Salt Flats in northwestern Utah is the premier land speed racing event for racers seeking to challenge existing international land speed records via FIA and FIM certification. 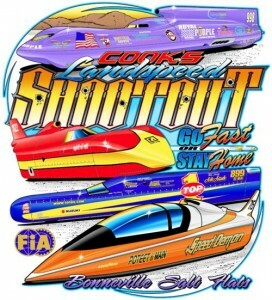 The shootout was established by Cook’s Land Speed Events in 2006 specifically to accommodate top tier racers wishing to challenge existing FIA and FIM certified international land speed records for cars and motorcycles. It is reserved for the fastest of the fast; cars and motorcycles clearly capable of challenging world record speeds. FIA records are clearly defined by the world certifying authority, the FIA (Federation Internationale de Automobile) , with three primary categories: special construction, production, and thrust-powered vehicles. FIA world record certification requires a two-way average exceeding a standing record by at least one percent. The FIA certification is conducted under the supervision of the USAC (United States Auto Club) officials. Motorcycle records and standards are equally defined by the world governing body, the FIM (Fédération Internationale de Motocyclisme) , or International Motorcycling Federation. And FIM certification is conducted under the supervision of the AMA (American Motorcycling Association) representatives. The fastest land speed racers in the world sign up for a chance to run at this prestigious event. Competitors are provided the opportunity to pursue specific FIA and FIM certified world land speed records in a safe, highly controlled environment designed to serve the unique requirements of world record attempts. At the event, motorcycles and motorcycle streamliners are provided equal opportunity to run for international records.The private shootout conducted by Mike Cook’s Land Speed Events provides world record quality cars, motorcycles and a select number of unique category vehicles a secure, easily managed venue for record attempts. Vehicles can run when they are ready without having to wait in long lines and they are assured of absolute timing accuracy by world certified authorities. By necessity, FIA and FIM world records require time constraints that do not easily mesh with larger events hosting hundreds of cars. FIA record attempts require a two-way average to be achieved within a one hour period. Motorcycle rules require a two hour turn around. The shootout was originally established as an invitation-only event for 400-mph streamlined race vehicles. The popularity of the event has grown to the extent that anyone desiring their name in the FIA or FIM world record book is welcome to apply. 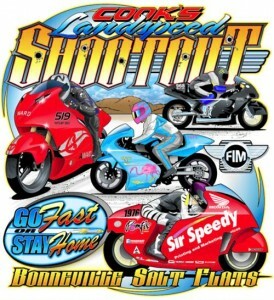 The Bonneville Shootout is a dedicated, tightly managed event for the fastest race vehicles, both car and motorcycle to set world records. It specifically caters to very high speed record breaking attempts and takes nothing away from traditional land speed racing venues such as the SCTA Speed Week or the USFRA World of Speed; both broadly popular with racers. The prestige and international recognition of FIA and FIM world speed records is the ultimate goal of shootout participants and the shootout provides them the best opportunity to pursue them on an FIA and FIM approved course with fully approved timing. Bonneville Shootout competitors are pursuing specific FIA and FIM certified speed records under various recognized automotive and motorcycle categories and of course the absolute wheel driven land speed record currently held by Don Vesco in the Team Vesco Turbinator and the motorcycle land speed record held by Rocky Robinson in the Ack Attack streamliner. The Land Speed Record is held by the fastest vehicle under the rules period. The official Land speed Record is clearly defined by the world certifying authority, the Federation Internationale de Automobile or FIA. For the purpose of definition there are three primary categories: special construction (category A), production (category B) and thrust powered vehicles(category C). Motorcycle records are certified by the FIM. Production records are held by a wide variety of vehicles in various categories primarily defined by engine size. Some Bonneville Shootout competitors pursue records in these categories and while broadly acknowledged in their own right they are entirely separate from and not a part of the official World Land Speed Record. We all agree however, that official land speed records are established by purpose-built unlimited special construction vehicles, either thrust powered or wheel driven. 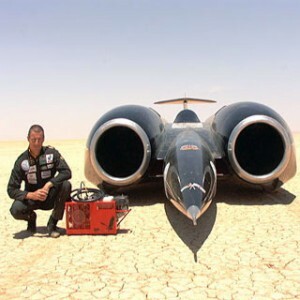 The current World Land Speed Record is held by Andy Green driving Richard Noble’s Thrust SSC, a thrust powered, twin jet vehicle that set the supersonic record on land at a staggering 763.035 MPH. Thrust SSC achieved a peak speed of 771 MPH or Mach 1.03 accompanied by a confirming sonic boom and worldwide acclaim. Thrust SSC is certified by the FIA as the official Absolute Land Speed Record Holder. The separation between thrust powered and traditional wheel-driven vehicles was sorted out in the sixties and we have all abided by the agreement since then.Purists and traditionalists have long held that the land speed record must be wheel driven and to a point they have a legitimate argument, but the fastest vehicle is the fastest vehicle period. Hence separate records for three categories have been recognized for nearly fifty years. Purists further argue that wheel-driven cars must be piston powered even though pistons did not establish the original land speed record and indeed the first land speed record was set by an electric vehicle and later even steam powered vehicles.In a traditional sense piston powered, wheel-driven vehicles have set and held the most records for the longest period of time, but the rules have never specifically stipulated pistons. Most records are also subdivided not only by engine size, but also if the engine uses a supercharger or turbocharger. The idea is keep things fair among competitor classes. However, over in the production category none of the record holders seem interested in wearing the “world’s fastest production crown” and those classes are not as hotly contested as the special construction category. Donald Campbell’s Bluebird established the first official 400 MPH-plus record with a 403.135 average in 1964. Campbell’s car was powered by a 4,100 HP turbine engine driving the wheels via a direct mechanical connection, thus completely legal, officially certified and fully acknowledged by the Summers Brothers who set out to break it with their piston powered Goldenrod in 1965. Bob (Butch) Summers raised the record to 409.277 MPH with four naturally aspirated Chrysler Hemi V8s. Piston purists have been chasing that mark ever since and no one has ever cast dispersions on Campbell’s official turbine powered record.In 2001 Don Vesco’s turbine powered Turbinator raised the official wheel-driven land speed record to 458 MPH and that’s the recognized benchmark top Bonneville Shootout competitors are gunning for. To be sure it is possible to set FIA records in lesser categories, but the Holy Grail is the Turbinator’s unlimited wheel-driven record. The legitimacy of Campbell’s 1964 turbine powered record officially reinforces Turbinator’s claim to the wheel-driven land speed record and contenders will have to exceed it by one percent to claim the title. Moreover, Vesco can still claim the fastest exit speed with a stunning 470 mph blast on the books. 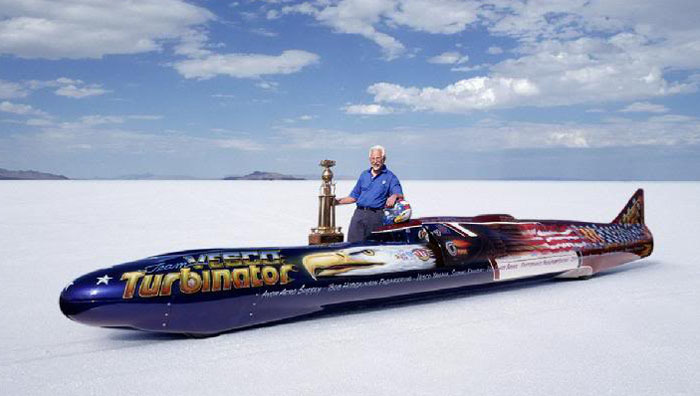 Al Teague broke the Summers Brothers record in 1991 with a 409.986 MPH average establishing an official Bonneville record as well as a FIA certified land speed record, but in the supercharged class. Teague and others have repeatedly penetrated the 400 MPH mark with significantly higher speeds that remain largely unacknowledged because supporting return runs were not accomplished. And lest we all forget, the Goldenrod delivered a scorching 428 MPH one way pass the day after it set its record 47 years ago. 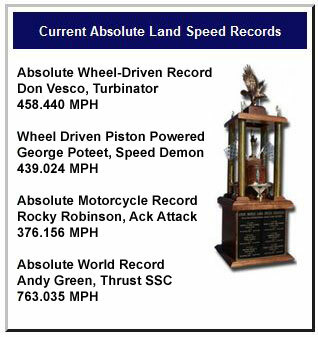 Charles Nearburg, Nolan White, Tom Burkland, George Poteet and others have all established Bonneville records above 400 MPH, some significantly faster and some FIA certified per specific category, but none with the authority of a FIA certified two way average exceeding Vesco’s record by one percent. Poteet’s Speed Demon is currently the fastest FIA certified piston powered wheel-driven car by virtue of it 439 mph record, but it is not yet the land speed record holder. 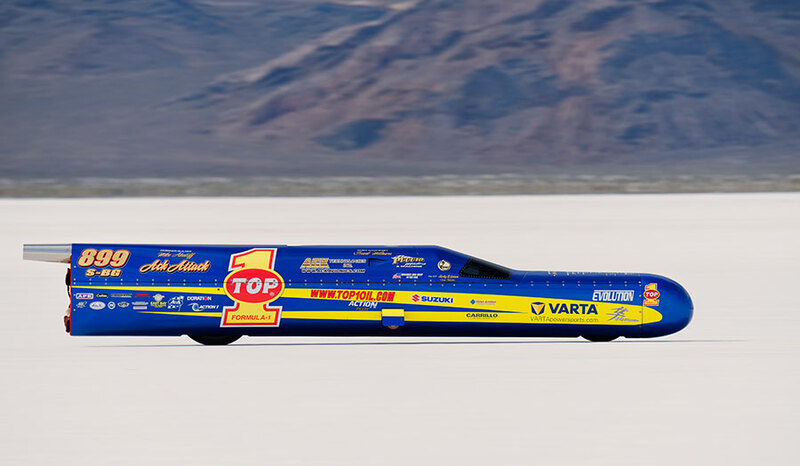 Burkland’s streamliner currently owns a 417.020 MPH AA-Blown Fuel Streamliner Bonneville Record toppling Teague’s old mark and the Poteet and Main Speed Demon has run a 457 MPH one way with a 462 MPH exit speed, but no return run. Hence TEAM Vesco’s Turbinator remains the car to beat for now, but more teams than ever are rallying for an all out assault on the wheel driven record. All of the current contenders are piston powered and a successful endeavor by any one of them will convey extraordinary bragging rights to the victor and the Bonneville Shootout where we expect the next great achievement will occur.